This study addresses the issue of the competition between the United States and Russia in the Middle East. The study examines the most important aspects which the two powers are competing for in the Middle East. These aspects include: geopolitical field, energy field and arms race. To better understand the US-Russia competition in the Middle East, the current Syrian crisis is taken as a case study. The investigation shows that the attitudes of the United States and Russia have been contradictory and disagreeable in Syria. The strategic interests and objectives that one party seeks to achieve are contrary to the interests and objectives of the competing party. As a final result, the study proved that what is happening in Syria represents the sharp competition between the United States and Russia which can be considered as an extension of their broader competition in the Middle East region. Also, since Syria holds a significant position in the region in strategic, economic, and energy terms, the possibility of reaching a complete solution depends on the compatibility of visions and attitudes between the two major powers and this is unexpected to be accomplished in the near future. Berryman, J. (2012). Geopolitics and Russian foreign policy. International Politics, 49 (4), 530-544. Bilgin, M. (2009). Geopolitics of European natural gas demand: supplies from Russia, Caspian and the Middle East. Energy Policy, 37 (11), 4482-4492. Doi:10.1016/j.enpol.2009.05.070. Blake, J., Mahmud, A. (2013). A legal red line: Syria and the use of chemical weapons in civil conflict. UCLA L., 61, Rev. Discourse, 244-260. Borshchevskaya, A. (2013). Russia’s many interests in Syria. The Washington Institute. Cohen, A. (2006). US interests and central Asia energy security. Backgrounder. Dannreuther, R. (2015). Russia and the Arab spring: supporting the counter-revolution. Journal of European Integration, 37 (1), 77-94. Eker, K. (2013). The Russian role in Syrian crisis and the Middle East region. New Lebanon. Fawcett, L. (2016). International relations of the Middle East. Oxford University Press. Fleurant, A., Perlo-Freeman, S., Wezeman, S. T., Wezeman, P. D. (2016). Trends in international arms transfers, 2015. SIPRI Fact Sheet. Gafarli, O. (2012). Russian foreign policy in light of changing balances in the Middle East. Turkish Policy Quarterly, 11(1), 141-149. Hermann, C. F. (1969). Threat, time, and surprise: a simulation of international crisis. In Hermann C. F. (Ed. ), International Crisis (187-211). New York: Free Press. Holland, S., Cooney, P. (2017). Trump orders targeted military strike on Syria. Retrieved 17.02.2018, from https://www.reuters.com/article/us-mideast-crisis-syria-trump/trump-orders-targeted-military-strike-on-syria-idUSKBN179088. Khrestin, I., Elliott, J. (2007). Russia and the Middle East. Middle East Quarterly. Little, D. (2008). American orientalism: The United States and the Middle East since 1945. University of North Carolina Press. Lo, B. (2008). Vladimir Putin and the evolution of Russian foreign policy. Wiley & Sons. Mansour, M. M. (1995). The U.S-Soviet conflict in the Middle East. Cairo, Egypt: Madbouly Library. Mason, J., & Perry, T. (2017). Trump says chemical attack in Syria crossed many lines. Retrieved 17.02.2018, from https://www.reuters.com/article/us-mideast-crisis-syria-idlib/trump-says-chemical-attack-in-syria-crossed-many-lineidUSKBN1770YU?feedType=RSS&feedName=newsOne. Mohns, E., & Bank, A. (2012). Syrian revolt fallout: End of the resistance axis? Middle East Policy, 19 (3), 25-35. Nazemroaya, M. D. (2006). Plans for redrawing the Middle East: The project for a “New Middle East”. Global Research, 18. Nichols, M. (2017). Russia casts 10th U.N. veto on Syria action, blocking inquiry renewal. Retrieved 17.02.2018, from https://www.reuters.com/article/us-mideast-crisis-syria-chemicalweapons /russia-casts-10th-u-n-veto-on-syria-action-blocking-inquiry-renewal-idUSKBN1DG31I. Sharp, J. M. (2005). The broader Middle East and North Africa initiative: an overview. Library Of Congress Washıngton Dc Congressıonal Research Servıce. Sharp, J. M., & Blanchard, C. M. (2012). Syria: Unrest and US policy. Paper presented at the Congressional Research Service (CRS) Report for the Congress. Shueibi, I. F. (2012). War over gas. struggle over the Middle East: Gas ranks first. Retrieved 17.02.2018, from http://www.voltairenet.org/article173718.html. Sladden, J., Wasser, B., Connable, B., Grand-Clement, S. (2017). Russian strategy in the Middle East. RAND Corporation. The Voice of Russia. (2012). Customs union and Syria: Trading prospects. Retrieved 17.02.2018, from https://sputniknews.com/voiceofrussia/2012_05_25/75993311/. Valenta, J., Valenta, L. F. (2016). Why Putin wants Syria. Middle East Quarterly. Wilhelmsen, J. M., Haugevik, K. M. (2016). Strategic cooperation against terrorism, Russia’s initial positions on Syria. NUPI policy brief 37/2016. ISNAD YURTSEVER, Serdar , ALAMAILES, Abubaker . "SYRIAN CRISIS IN SCOPE OF THE US-RUSSIAN COMPETITION IN MIDDLE EAST". 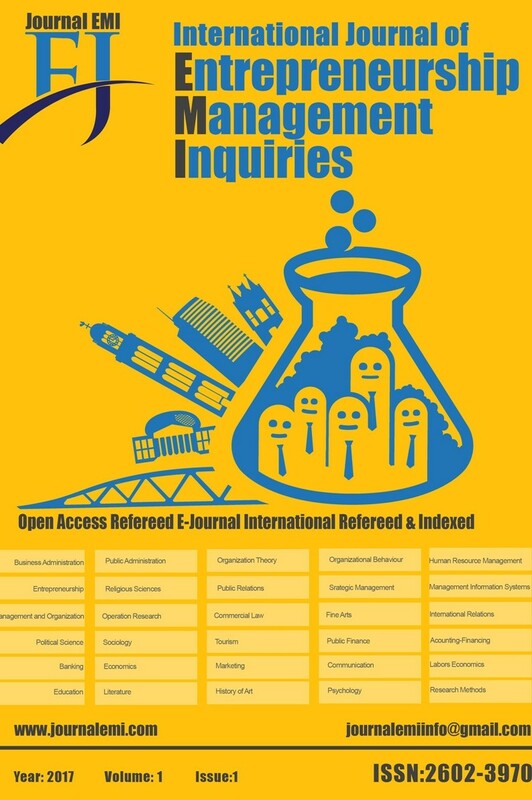 International Journal of Entrepreneurship & Management Inquiries (EMI) 2 / 3 (December 2018): 33-48.